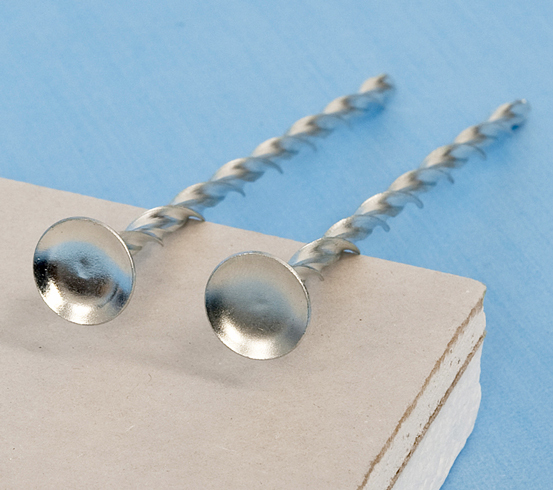 Drywall Insulation Fixings Solve the Problem! A Twistfix customer needed an easy way of fixing plasterboard laminated warm roof insulation board to the underside of oak rafters on a farmhouse refurbishment in Warwickshire. He also required a fire-proof mechanical fixing to fasten the plasterboard laminates to the masonry walls in order to meet fire regulations. We told him that our Drywall Insulation Fixings would be the perfect solution. Mr Kelsey ordered 145mm long Drywall Insulation Fixings from us in order to fix 102mm laminated plasterboard to the underside of pitched oak rafters and to fix 72mm laminated plasterboard to the masonry wall. In both the masonry wall and the oak rafter situations our expert team advised him that a 5mm pilot should be drilled and then the helical fixings should be driven in with a lightweight SDS drill using a special adapter which was supplied. Mr Kelsey said that after being advised he set about the task which was extremely easy and the special dish-profiled head of the fixings sunk nicely into the surface of the gypsum board, the system being almost impossible to over tighten. “Twistfix were excellent to deal with! They were extremely helpful and the delivery of the items was actually organized very quickly! The drywall insulation fixings worked brilliantly! Twistfix supplies a full range of insulation fixings which have proven to be extremely popular with many of our customers since their arrival. If you need help and guidance regarding which insulation fixings to choose for your specific requirements then please do not hesitate to call us. Our expert team have had many years experience within the industry and can offer sound advice. For more information please call us on 0845 1236007 or email info@twistfix.co.uk.